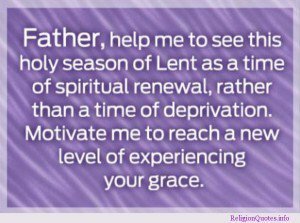 During Lent we attempt to become closer to God. This small prayer to our Heavenly Father expresses that attempt succinctly. Without grace we cannot live the life God created us to live. Prayer, abstinence, fasting, and corporal works of mercy strengthen our spiritual being which opens the floodgates to mercy.